Over the summer I had some time on my hands and started thinking about my favorite holiday, Halloween! Just like many of the themes and ideas on Family Guy, I wanted to do something that really reminded people of the 80’s! Just then one of my favorite movies popped into my head “BIG”! I would do the ZOLTAR arcade machine! I thought a homemade Zoltar Halloween costume would be a big hit because it’s probably the most famous arcade machine known to man! For the next 3 months I began construction on the legend himself “ZOLTAR”! After multiple trips to Menards, Hobby Lobby, and JoAnn Fabrics he began to take shape. Many hours were spent scouring eBay to find just the right prop or piece of clothing to complete the costume. Finally with Halloween just around the corner my “Wish” came true and ZOLTAR was completed. From the expressions on people’s faces at different bars and parties, I could tell I had accomplished my mission. Everyone flocked to the machine to catch a glimpse of the wish master himself. People were amazed at the attention to detail, and many actually thought I was a prop and not a real person! 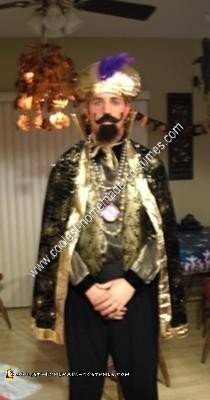 The costume I wore was made up of black pants, silk gold shirt, black cummerbund, gold vest, gold turban, gold spider web cape, gold rings, gold earrings, and of course a fake beard and mustache. Most of these items were all found on eBay…..what a great place for costume shopping. 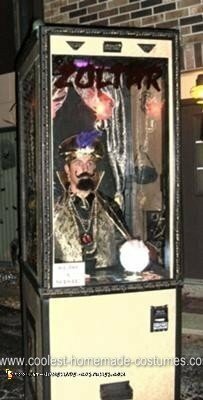 The ZOLTAR arcade machine costume was built on a skeleton of 2 x 4’s surrounded by heavy board and plexi-glass. It was also on wheels which made it easy to move from place to place. The overall weight of the costume was about 80 pounds. To stay cool I installed a fan that ran off of batteries and the ceiling has a trap door to let some fresh air in. 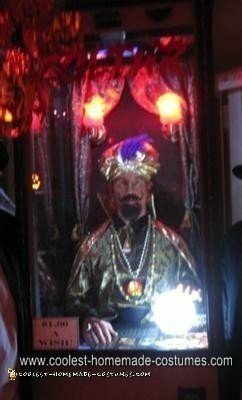 The homemade Zoltar Halloween costume had a light up crystal ball, sconce lights, strobe light, and even a black light. The crystal ball and sconce lights ran off of LED battery pack lights. It was decorated with Tarot Cards, Necklaces, Gold Coins, Fancy Fabrics, and Vinyl Stickers. But by far the most popular part about the costume was that it dispensed homemade wish cards down a front slot for anyone who wanted one. I even bought a few BIG VHS movies on eBay to give out as prizes to some lucky customers. In the end all of the hard work paid off! 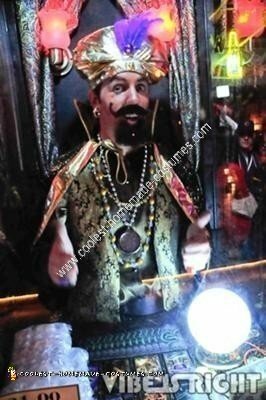 ZOLTAR costume was a crowd favorite and fulfilled many people’s wishes that night. My last obstacle now is storing this beast of a costume……BEST COSTUME HALLOWEEN EVER! Hope you enjoy the pictures and let me know if you have any questions! Best Zoltar costume I have ever seen!